A Memorial for Michael Shenker from The Local East Village on Vimeo. With chants, signs and a New Orleans-style brass band, about 100 friends of community activist Michael Shenker honored his life with a parade-like procession Saturday through the streets of the East Village. The procession, which began near Mr. Shenker’s home on the southeast side of Tompkins Square Park, wound its way past some of Mr. Shenker’s favorite places in the neighborhood and ended several hours later with a memorial service at The Catholic Worker on Second Avenue and First Street. Mr. Shenker, who died earlier this month of liver failure at the age of 54, was a squatter and activist known for his advocacy on housing issues and the preservation of community gardens. With chants of “Long live Michael,” members of Saturday’s procession – led by Aresh Javadi, a puppeteer who knew Mr. Shenker for a dozen years – spontaneously pulled weeds at a garden on Avenue C (before the space’s perplexed owner asked them to leave) and stopped at such locations as 319 East Eighth Street. 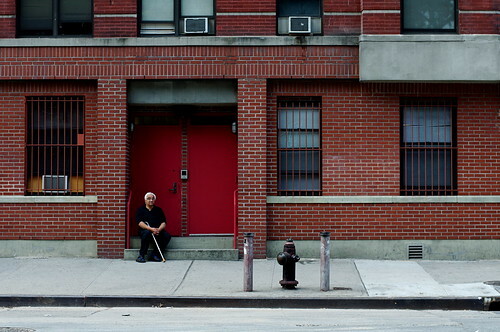 It was there that Fran Luck first met Mr. Shenker 25 years ago, when Mr. Shenker was working to turn what was then an unoccupied and neglected building into a popular squat. Today, the building is fully renovated with modern amenities. “The gathering today shows the power, not only of Michael, but of an era we went in together for our neighborhood against gentrification,” said Ms. Luck. Some of what we’re reading today: EV Grieve has a post about an exhibit at the New City Gallery by Peter J. Ketchum. Neighborhoodr writes about the arrival of the Urban Speaker in Tompkins Square Park this afternoon. And reading The Villager’s fine appreciation of Michael Shenker reminds us to point out the first-person post about Mr. Shenker that we published Thursday that was written by NYU Journalism’s Dyan Neary. Photo by Fly Michael Shenker. Michael Shenker, a homesteader and long-time community activist in the East Village, died Saturday of liver failure at the age of 54. NYU Journalism’s Dyan Neary, a friend of Mr. Shenker’s, prepared this first-person recollection of his life and the morning of his death. I wake with a start at 7:25 a.m., sucking air through my lips with a slow whistle and blowing it out again. Nikita is waving at me from her crib. I feel reinvigorated somehow. It is 7:25 a.m. and I want to apologize to everyone I have ever harmed, even in the smallest of ways. I write an e-mail to Brian, a masterful exercise in humility and accountability. For being a stress case and for being difficult when I was pregnant. I read several books to my daughter. At 10:30 I gently unroll the down comforter to reveal Brian’s sleeping face. Out the window, I can see so much of the skyline, buildings stacked upon buildings and the Empire State climbing higher than all of them now, the centerpiece to a misshapen staircase like a three-dimensional collage of various shades of tawny overlapping tan. I’m going to see Michael in the hospital, I tell Brian. Nikita has been changed, fed, read to. I place a kiss on his forehead. Check your e-mail. EV Grieve has an informative post about some of the memorials that are planned for Michael Shenker, the homesteader and longtime neighborhood activist who died Saturday. Later today, we’ll feature a post by NYU Journalism’s Dyan Neary, who offers a personal perspective on Mr. Shenker.